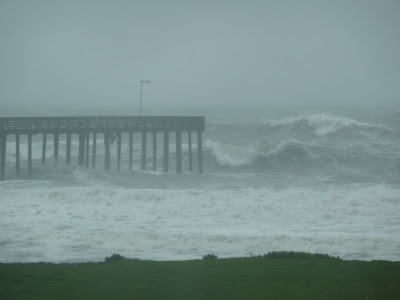 A huge storm is hitting the central coast this week. 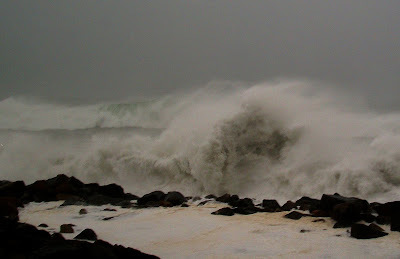 But last week we had a storm that brought in such big surf that we could hear the roaring of the waves from our house! 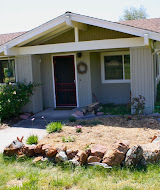 Our house that is 7 miles from the shore. SEVEN MILES. Steve usually can't even hear me call his name from our front door to the edge of the driveway. But we could hear WATER from 7 miles away! So at 11pm on Wednesday night we donned our rain gear and drove down to the Pismo Beach pier to see the action for ourselves. Now let me take a moment to explain something about myself. I don't have nightmares very often, but 95% of my nightmares include a body of water, giant waves, and sea creatures all crashing together to form The End of the World! This is probably the reason why I've never been on a cruise, I freak out snorkeling in 3 foot waters, and I swim only in water where I can see my own feet. It could also possibly be the reason why I CRIED while we were at the pier on that Wednesday night. Yes. I CRIED. I blubbered and squealed and covered my eyes. And while we were standing at the edge of that wooden pier, beyond the edge of the Earth, looking out over the creaky railing into the blackness of the black ocean on the blackest night of my life, a ginormous black wave would sneak up on us and BOOM! smash into the weary legs of the pier causing the entire structure to shake and rumble. At first I was okay. As we began our descent down the pier the waves didn't seem very scary. There was lots of pointing and Wowing and Oohing and Aahing, but no crying. It was the dark emptiness beyond the tip top of the pier that really struck me. The waves became a surprise. Would the next one be tiny and would we just laugh at it? Or would the next one come up and over the pier and wash us away? Or maybe it would make the pier crumble and fall into the ocean. Then we'd definitely be eaten by sharks or strangled by Octopi or both at the same time! All of these thoughts went rampant through my mind and then, you will never believe it, but my head spinned 360 degrees three times after only 10 seconds of looking into the evil soul of those waves. I kid thee not. That's when I sprang back, looked at Steve who was leaning his entire body as far over the railing as he possibly could in order to get a closer look at the beast below. And I lost it. Tears gushed from my face. I pictured him being swept away by a tsunami-sized wave while I witnessed his death, helpless, cold, and alone. I imagined us hand-in-hand, flailing down the pier towards the shore, trying to outrun the Wave of Death, but no no no, there's no way to outrun the Wave of Death! It would tease us by tickling our heels and then it would hurl itself at our backs, and of course we'd trip and fall and get tossed around by the monster and we'd struggle to find each other under the blackness of the icy water - if we were going to die, we were going to die together! So that is why I cried. I begged Steve to step away from the railing and go back to the car ASAP. But, as we were 3/4 of the way back down the pier towards safety, I looked up at his wide-eyed wet face, smiled, and said, "That was fun! Let's do it again!" This time, I didn't shed a single tear.